Professor Janette Greenwood, center, meets with Toni Armstrong ’19, left, and Alice Dillon ’19 this summer at the Worcester Art Museum to discuss the upcoming exhibition “Rediscovering an American Community of Color: The Photographs of William Bullard.” At right are the maquettes, small-scale models of the exhibition. 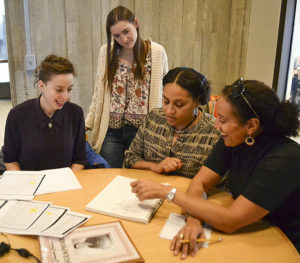 For several months last spring, students in a Problems of Practice history seminar at Clark University painstakingly dug through genealogical records and worked with descendants to unlock the mysteries behind turn-of-the-century photographs of African-Americans and Native Americans in Worcester. 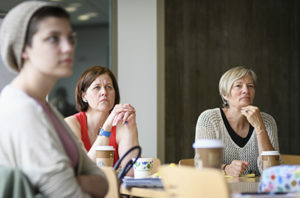 Professor Janette Greenwood, right, taught the Problems of Practice course with Nancy Burns, center, of the Worcester Art Museum. Here, they watch student presentations on their research into the William Bullard photos; at left is student Darice Plumer ’17. This fall, their research culminated in an exhibition at the Worcester Art Museum: “Rediscovering an American Community of Color: The Photographs of William Bullard.” See photos from the Oct. 19 Master Series Third Thursday event, when students answered questions about the exhibition and their research. Between 1894 and 1917, William Bullard, a white photographer in Worcester, took 5,400 photos of local streetscapes, businesses and residents, including 225 formal portraits of his neighbors, many of them people of color, in the city’s Beaver Brook neighborhood and surrounding areas. 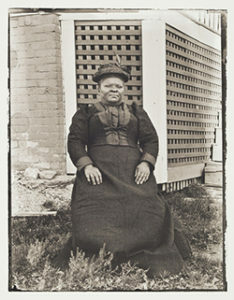 The museum’s show features more than 80 of those portraits, printed from Bullard’s glass negatives. “This is a real diamond that we have here,” says Janette Greenwood, professor of history. “We have the names of all these people in the photographs and the opportunity to connect with the descendants and tell these stories. 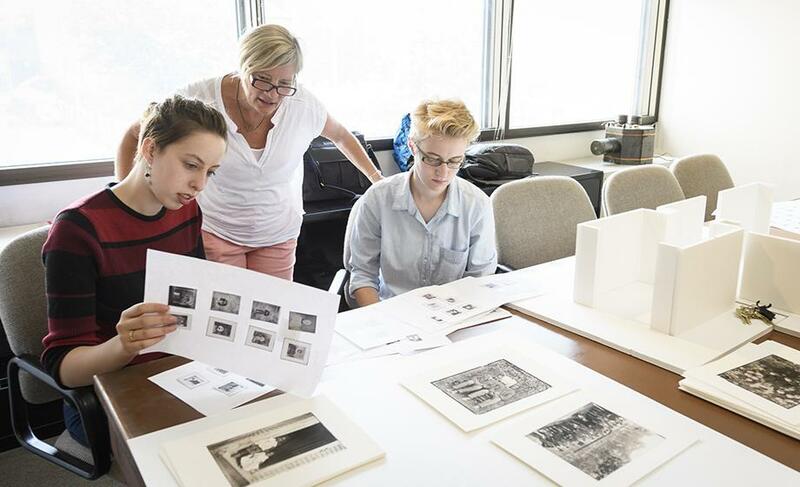 In historical research, it doesn’t always happen like this.” Greenwood taught the spring 2017 Problems of Practice (POP) course, “Public History: Race, Photography and Community,” with Nancy Burns, the museum’s associate curator of prints, drawings and photographs. Running through Feb. 25, 2018, the exhibition has been in the works for almost four years. Over that time, Greenwood has worked closely with Frank Morrill, the Charlton, Mass., historian who owns Bullard’s glass negatives, and with a community advisory board composed of the descendants of the “sitters,” the people in the portraits. Greenwood’s students have interviewed several descendants, who, with Morrill, attended the students’ final course presentations in May. Yet the exhibition might never have happened if Morrill’s 10-year-old granddaughter, Hannah, hadn’t been closely examining the negatives one day while helping her grandfather with research. Morrill had purchased the Bullard collection from an East Brookfield resident whose grandfather, a postal carrier, had acquired them from Bullard’s brother. Bullard committed suicide in 1918 at the family farmhouse in North Brookfield. “What’s this a negative of?” Hannah asked, holding up an image of an African-American woman. The negative had a tiny number scratched on the corner of the negative: 76. Morrill suddenly remembered Bullard’s detailed log book, tucked away in a box. The book contains the names of many of his sitters, matched with the numbers he’d etched on the glass plates. No. 76 was Celia Perkins. “What do I have here?” Morrill wondered. Through a connection at the American Antiquarian Society, he heard about Greenwood, author of the 2010 book “First Fruits of Freedom: The Migration of Former Slaves and Their Search for Equality in Worcester, Massachusetts, 1862-1900,” and called her in January 2014. When Greenwood first met with Morrill and saw the log book, she immediately recognized names from her research about Worcester’s communities of color. Coupled with census records and historical documents, Greenwood and Morrill initially identified about 80 percent of Bullard’s subjects. “The number of negatives William Bullard had, and the fact that we could identify most of the people in them by name and street number, is incredible,” Greenwood says. Greenwood soon began involving her students in researching the families’ histories, starting with her spring 2015 “Public History: Race in the U.S.” seminar. Last spring, 10 undergraduates in her “Public History: Race, Photography and Community,” seminar dove even deeper into the genealogical research, uncovering more details about the photos and their subjects – and filling in any gaps in the family trees. The students wrote the labels accompanying some of the Bullard photos on exhibit. On Oct. 19, they will answer questions from visitors at the museum’s Master Series Third Thursday event. 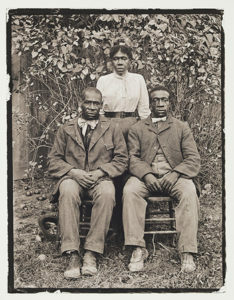 Maurice Wallace, associate director of The Carter G. Woodson Institute for African-American and African Studies at the University of Virginia, will present a lecture titled “We Look Like Men: Early Photography, War, and the Double-Bind of Black Manhood.” Strong Eagle Daly, a Nipmuc flutist, will play a tribute to his ancestors. “This has been a tremendous opportunity for undergraduate students to participate in groundbreaking research that has had an impact not only on individual families, but an entire community, with national implications,” Greenwood says. Toni Armstrong ’19, left, and Alex Jeannotte ’17, second from left, show records of the Perkins family to descendants and sisters Wendy Byfield, second from right, and Kim Perkins Hampton. In July, two students from the class – Alice Dillon ’19, an art history and history double major, and Toni Armstrong ’19, an art history and ancient civilization double major – met with Burns and Greenwood to review a small-scale model of the exhibition, called a maquette. They discussed the positioning of the portraits and how visitors might interact with and move through the exhibition space. Like their classmates, Dillon and Armstrong each focused on one photo and topic as part of their research. Armstrong worked with Alex Jeannotte ’17, a history and sociology double major, to research the Perkins family, who sat for 34 of the portraits – more than any other family. Armstrong and Jeannotte met several times with two Perkins sisters from Worcester – Kim Perkins Hampton and Wendy Byfield – to sift through family documents and old photos and review what the students had uncovered in their archival research. “It’s like a wild-goose chase,” Armstrong says of tracking down primary sources such as birth, death and marriage certificates, censuses, newspaper articles and obituaries. Perkins Hampton, whose family story and photos recently were featured in a Worcester Living magazine story about the exhibition, is appreciative of the students’ work.